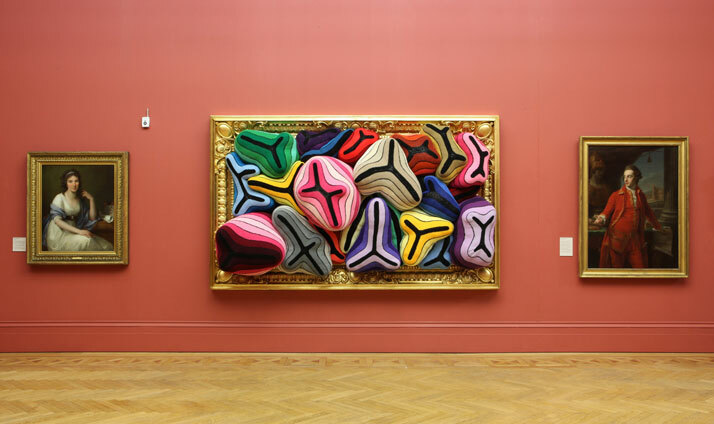 A riotous storm of colour is coming to Manchester as renowned Portuguese contemporary artist Joana Vasconcelos showcases her seductive and subversive large-scale sculptures for an exclusive site-specific exhibition at Manchester Art Gallery. 2014 Time Machine, Manchester Art Gallery, Manchester. 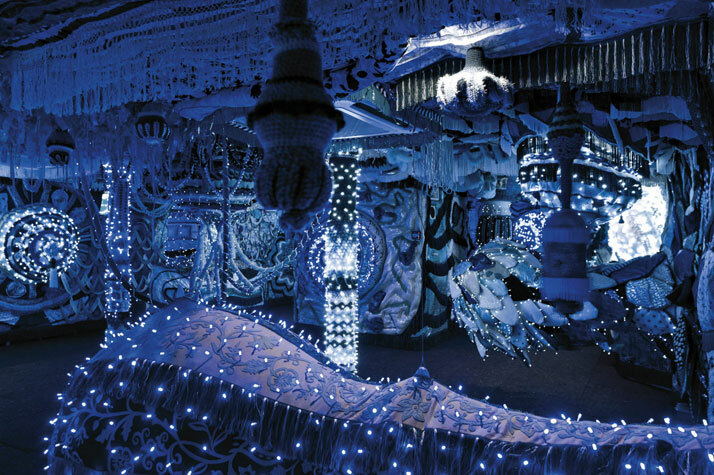 Joana Vasconcelos, A Noiva [The Bride], 2001-2005. 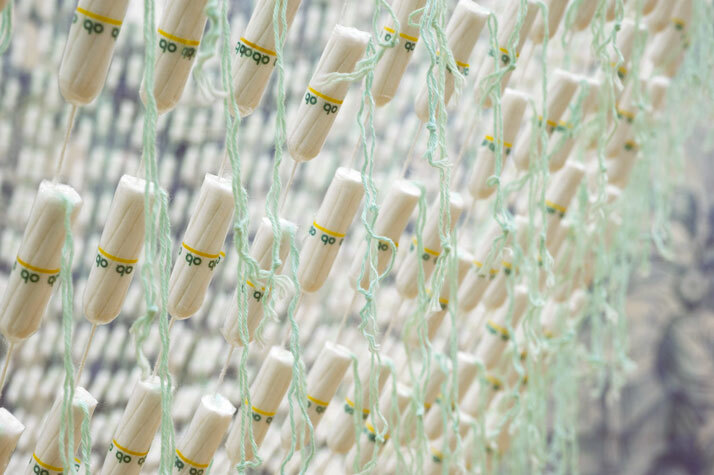 OB tampons, stainless steel, cotton thread, steel cables. 600 x Ø 300 cm. Work produced and restored with the support of Johnson & Johnson, Lda. Handmade woollen crochet, polyester, on canvas, stucco, gold leaf, MDF, iron. 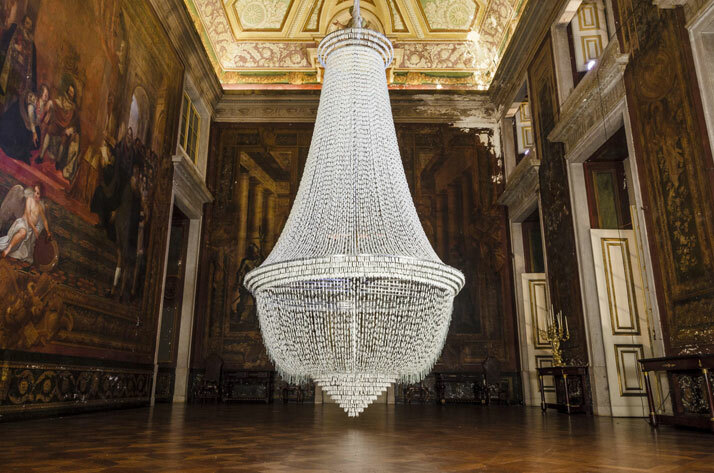 Joana Vasconcelos has come to be known for her acute sense of scale, peculiar choice of materials and mastery of colour, particularly after her highly regarded sculpture ‘The Bride’ – a 5m high chandelier made of 25,000 tampons – was exhibited at the Venice Biennale in 2005. 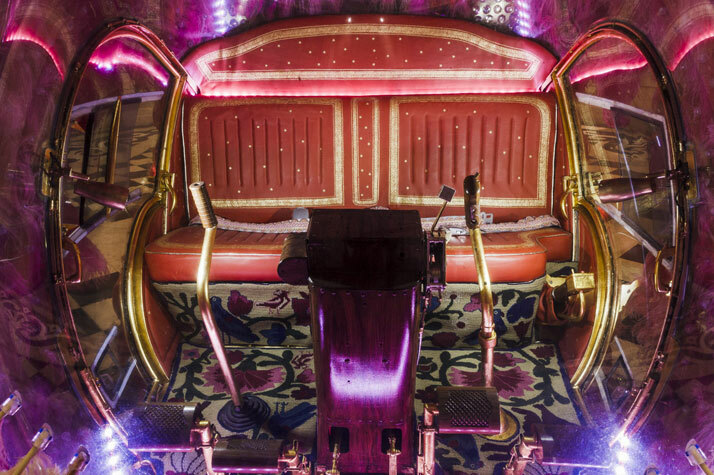 Showing a strong affinity for the decontextualisation and subversion of pre-existent objects and everyday realities, her work is a melting pot of tradition and modernity, popular and erudite culture, the private and the public, as well as the hand-crafted and the industrial. Seductive, humorous and exuberant, her sculptures directly challenge the pre-arranged routines of the quotidian, offering a critique of contemporary society by highlighting issues such as the status of women, class distinction and national identity. Handmade woollen crochet, industrial knitted fabric, polyester, stainless steel. 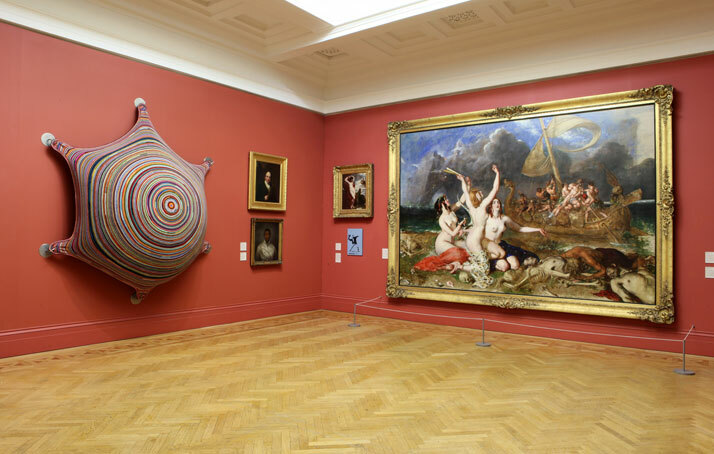 Joana Vasconcelos, A Todo o Vapor (Amarelo #1) [Full Steam Ahead (red #1), (green #1), (yellow #1), 2012-2014. BOSCH steam irons, PLC gearmotor, microprocessor-based electronic control unit, low pressure hydraulic system, stainless steel, demineralized water. Obra produzida com o patrocínio de Robert Bosch Hausgeräte GmbH. Viúva Lamego hand painted tiles, handmade woollen crochet, ornaments, polyester, MDF, iron. 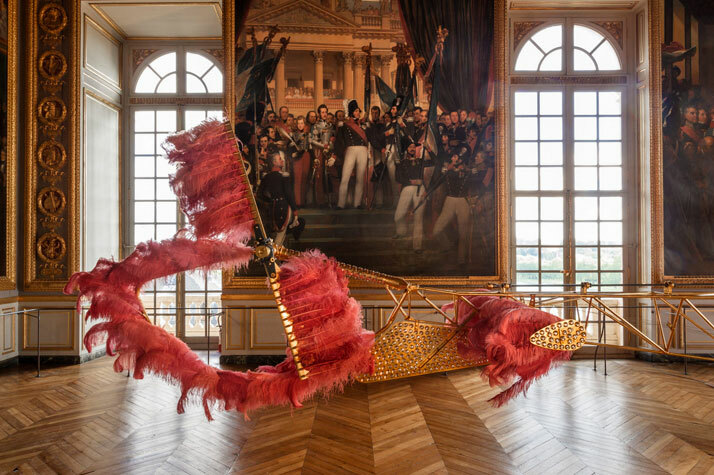 Joana Vasconcelos, Sibyl Vane, 2013. 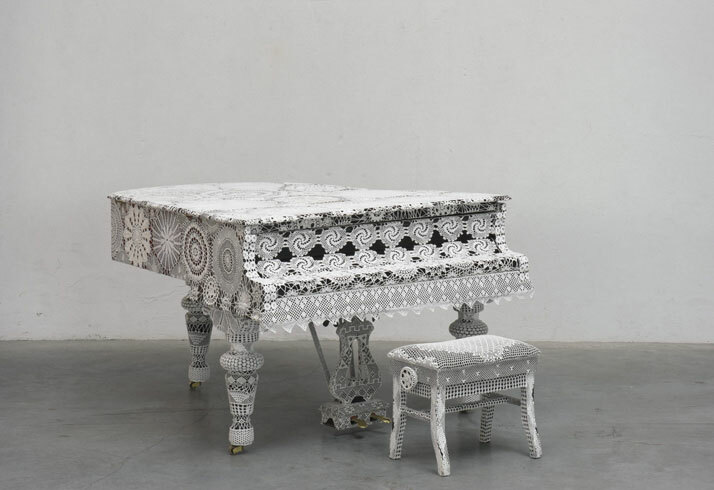 Rafael Bordalo Pinheiro faience painted with ceramic glaze, handmade cotton crochet. 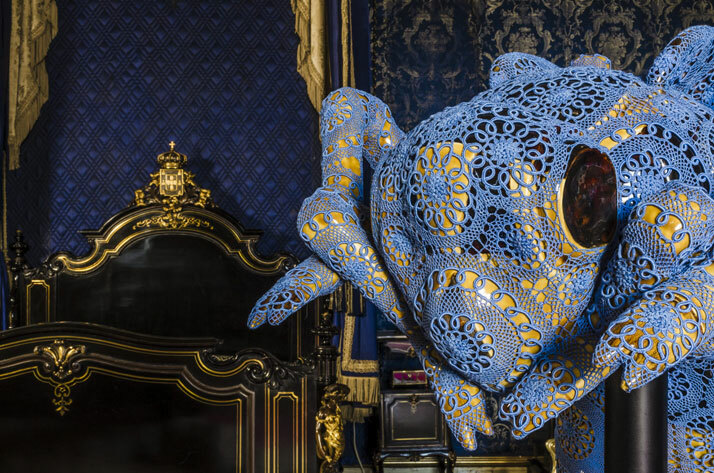 Joana Vasconcelos, Bond Girl, 2014. 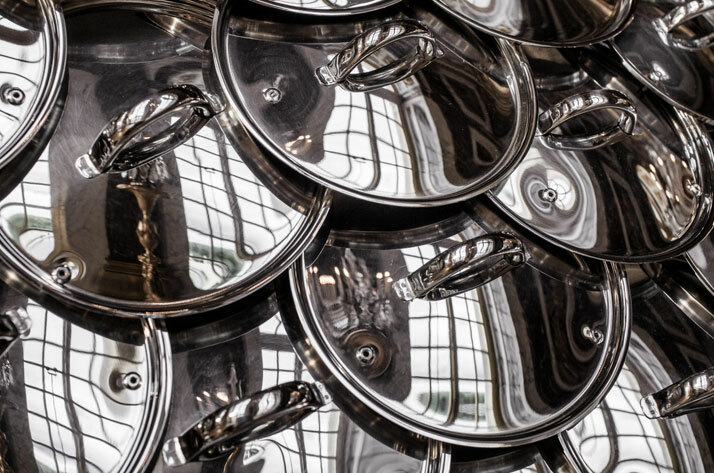 Stainless steel pans and lids, concrete. (2x) 297 x 155 x 410 cm. Work produced with the support of Silampos. Carrara marble lions and bases, Azores crocheted lace. In what is her most ambitious UK exhibition to date, ‘Time Machine’ promises to takes us on a journey thoughVasconcelos’ extravagant world of contextual appropriation where over twenty of the artist’s most significant sculptures are taking over the entire gallery building, filling its major exhibition spaces, adorning its exterior and acting as interventions with the gallery’s permanent collection. 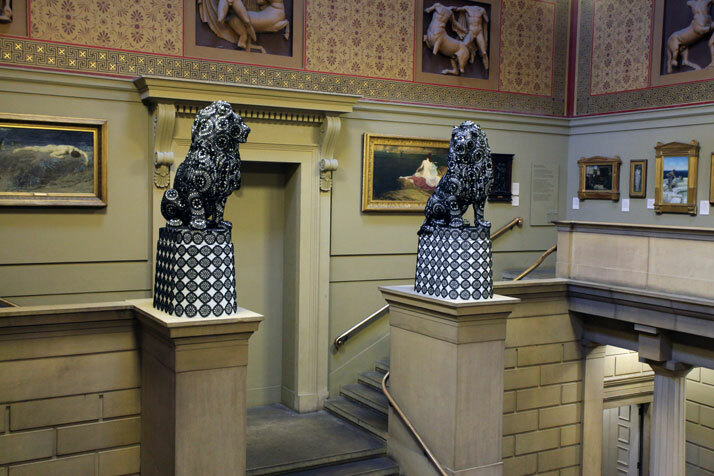 The highlight of the exhibition is the world premiere of a new textile work that has been specially commissioned as a site-specific installation for the gallery’s atrium and staircase. A new addition to the ‘Valkyries’ series, the aptly named ‘Britannia’ is a fabric patchwork extravaganza that weaves together knitting and crochet with fine silk, cotton velvets (referred to as Manchester cloth across much of the world), recycled clothes and industrially produced textiles embellished with Portuguese tassels, crystals and beads. Hanging in striking contrast to the straight, clean lines of the glass atrium, its brightly coloured organic forms cascade down the gallery’s stairs to then spill over the balconies, into the atrium, in a manic, riotous manner. 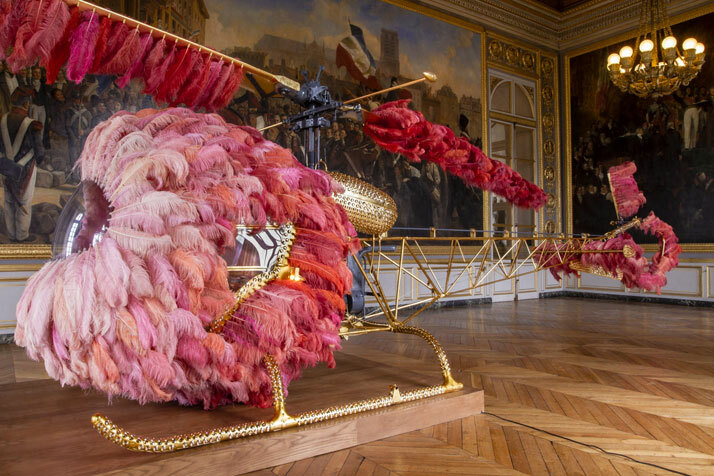 Bell 47 helicopter, ostrich feathers, Swarovski crystals, gold leaf, industrial coating, dyed leather upholstery embossed with fine gold, Arraiolos rugs, walnut wood, wood grain painting, passementerie. Courtesy Haunch of Venison/Christie's, London. Work produced in collaboration with Fundação Ricardo do Espírito Santo Silva, Lisbon. 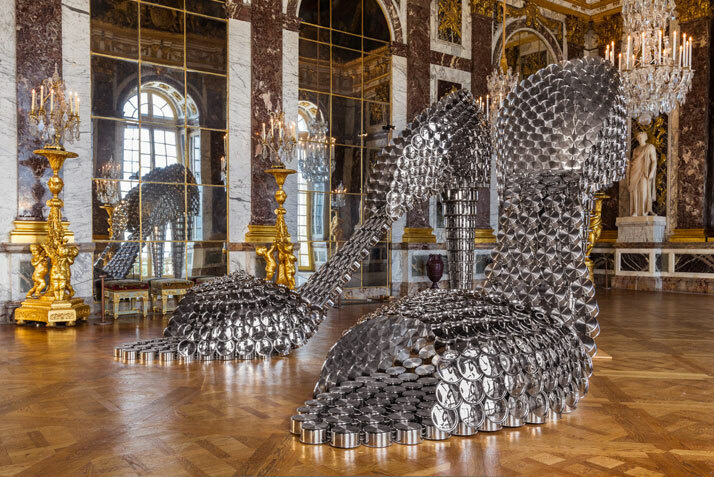 2012 Joana Vasconcelos Versailles, Château de Versailles, Versailles, photo © Joana Vasconcelos. 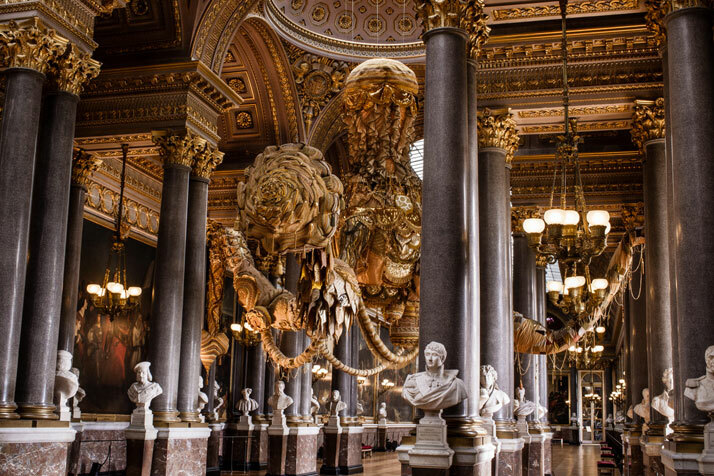 However, Joana Vasconcelos’ complete takeover of the gallery doesn’t end here; interventions have been ingeniously placed all over the gallery spaces – both inside and outside – to create unexpected, humorous and thoughtful connections both with the historical architecture of the building and works of art from the city’s collections. 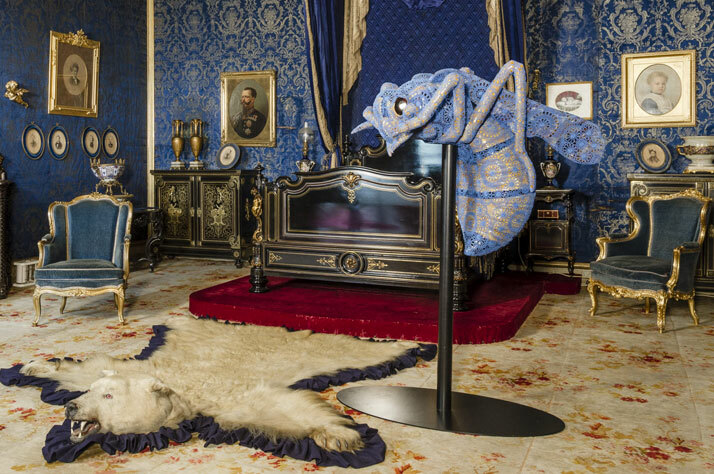 A new addition to the three-dimensional series of ‘Crochet Paintings’ has been produced in response to the gallery’s 18th century works, while William de Morgan wall tiles – on display in the Pre-Raphaelites gallery – are referenced in a new piece from Vasconcelos’ ‘Tetris’ series made out of tiles, crochet and various fabrics. 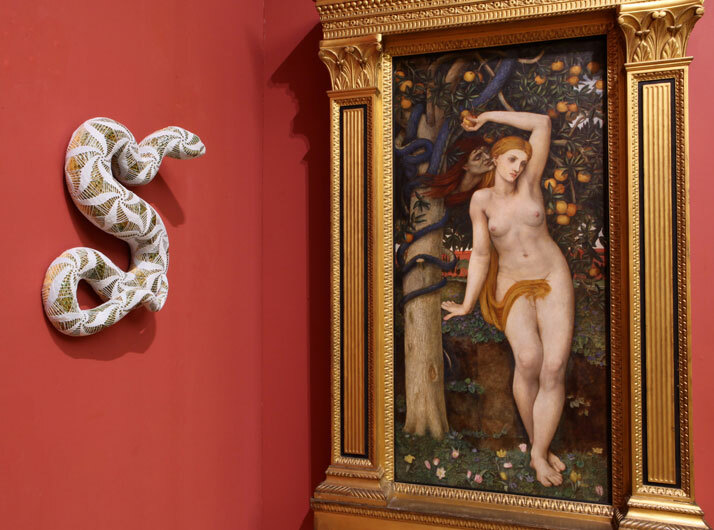 In addition to these, a new work for the ‘Cement Sculptures’ series has also been created in response to the gallery’s sculpture ‘Atalanta’ (1888) by Francis Derwent Wood and the painting ‘Eve Tempted’ (1877) by John Spencer Stanhope. Recalling classical statues of the sensual female form, ‘Bond Girl’, which is cast in cement, is vibrantly painted and decorated with crochet and hand-made net.. 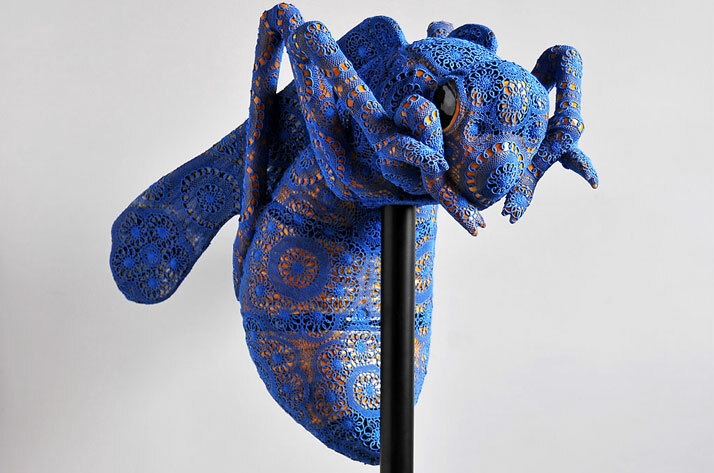 Finally, three of Vasconcelos’ sculptures from the ‘Full Steam Ahead’ series will be shown together for the first time. 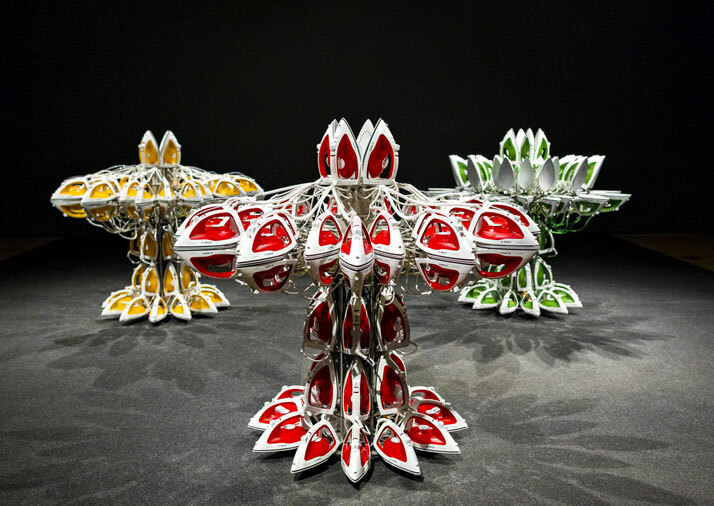 Red, yellow and green (the colours of the Portuguese flag), these kinetic flower-shaped sculptures feature steam irons as petals that slowly unfurl, turning the gallery space into a steamy robotic flower garden. 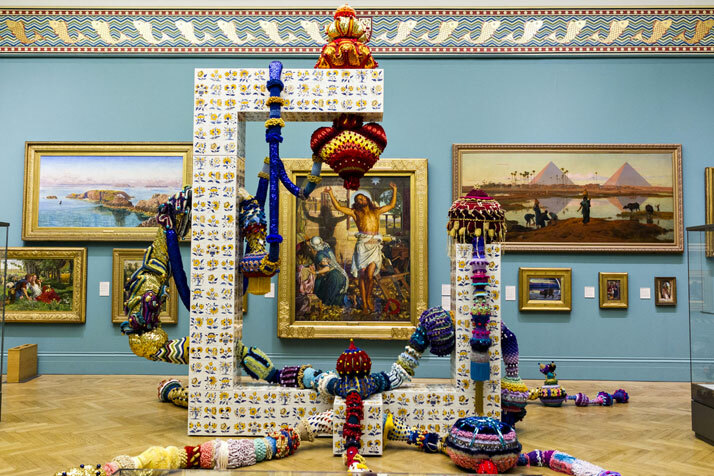 Displaying a wide selection of new and recent works, the majority of which have yet to be exhibited in the UK, Joana Vasconcelos’ ‘Time Machine’ will be stirring up Manchester’s cultural scene until 1 June 2014. 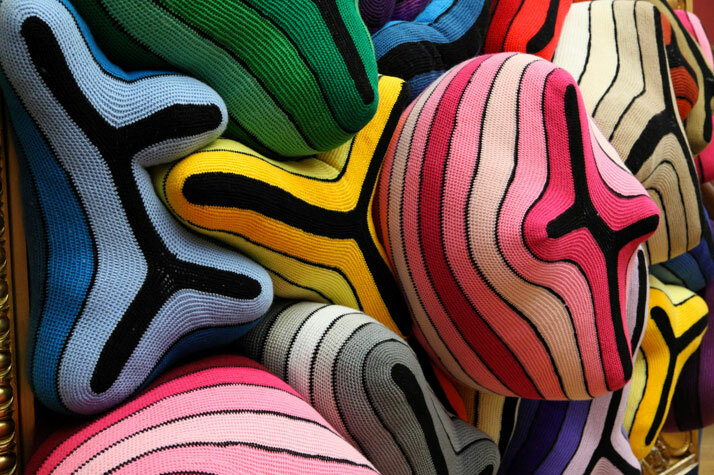 Joana Vasconcelos, Trafaria Praia, 2013. 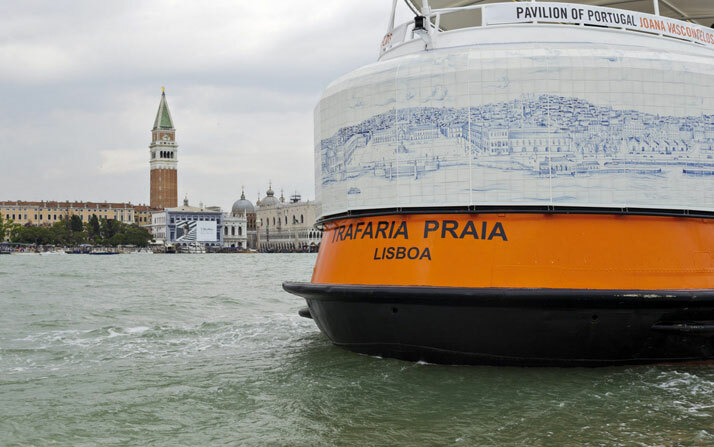 Trafaria Praia is Vasconcelos's proposal for the Participation of Portugal at the 55th International Art Exhibition - la Biennale di Venezia. 1960 motor-driven steel passenger ferry. Great Panorama of Lisbon (21st Century), 2013. 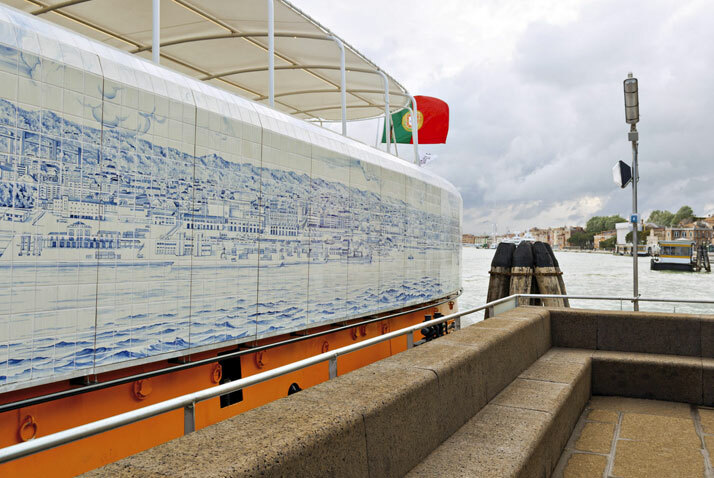 Viúva Lamego hand-painted, tin-glazed ceramic tiles on a sandwich-structured composite panel. Handmade woollen crochet, fabrics, ornaments, polyester, LEDs and electric system. 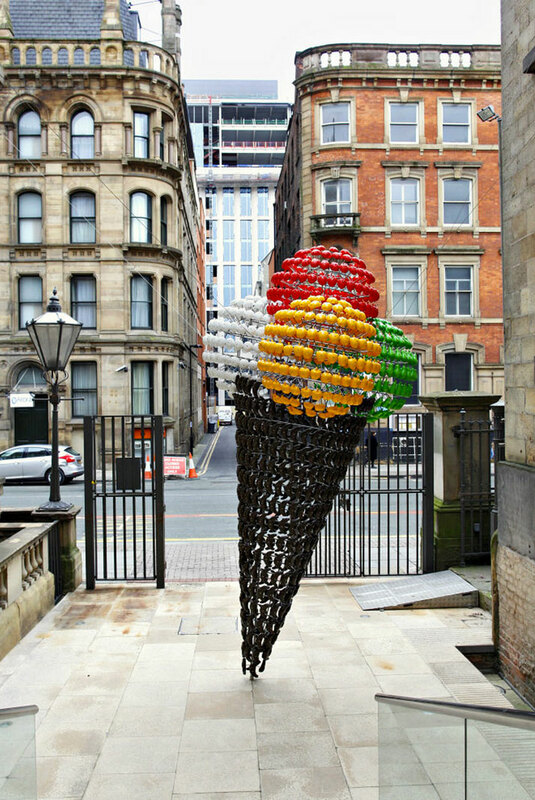 Joana Vasconcelos, Tutti Frutti, 2011. Plastic sand moulds, stainless steel. 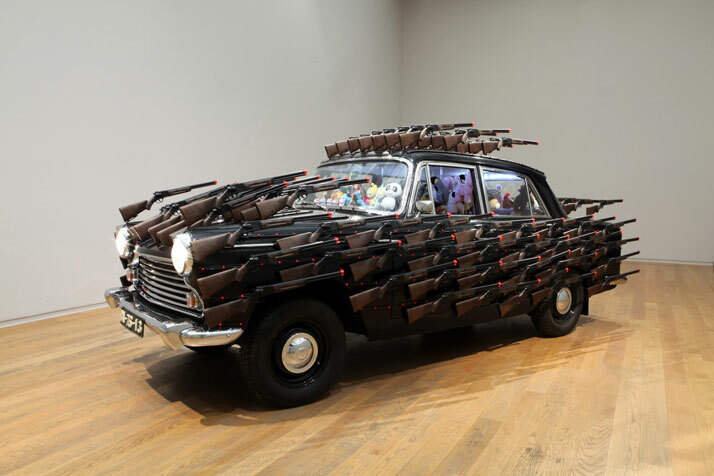 Joana Vasconcelos, War Games, 2011. 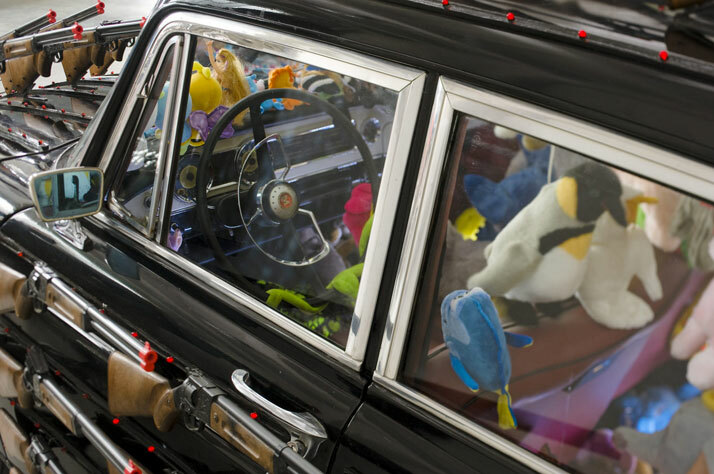 Morris Oxford VI, toy rifles, plush and plastic toys, LEDs, electronic controllers. 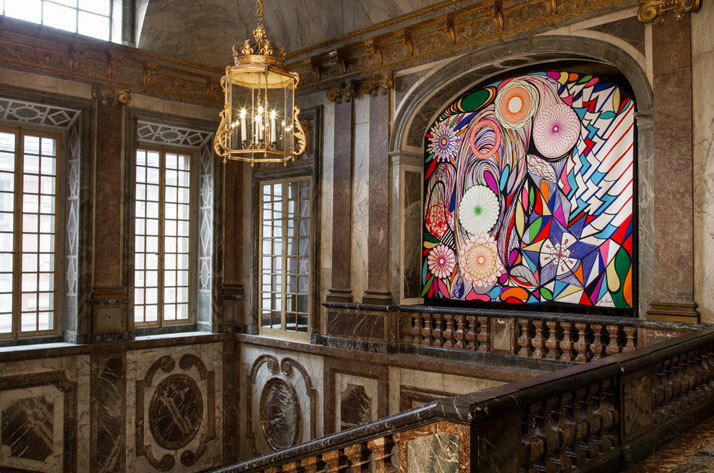 Work commissioned by Modelo Continente Hipermercados, S.A.
Joana Vasconcelos,Vitrail [Stained Glass Window], 2012. Work produced in collaboration with Manufactura de Tapeçarias de Portalegre. 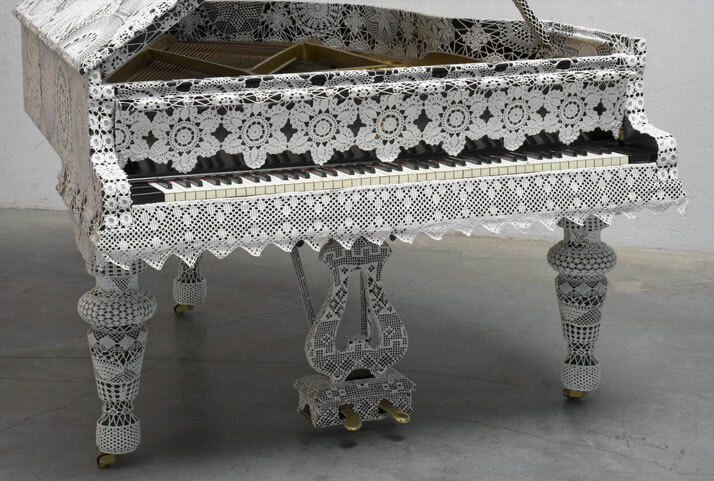 Joana Vasconcelos, Piano Dentelle, 2008-2011. Steingraeber & Söhne baby grand piano, piano stool, handmade cotton crochet. 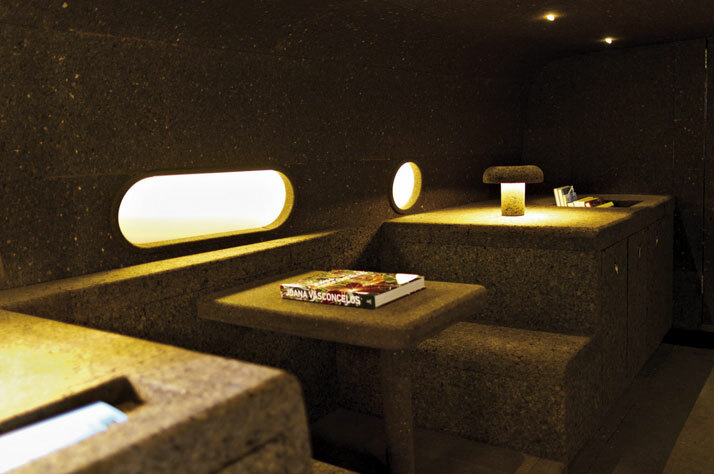 Private collection/Courtesy Haunch of Venison, London. 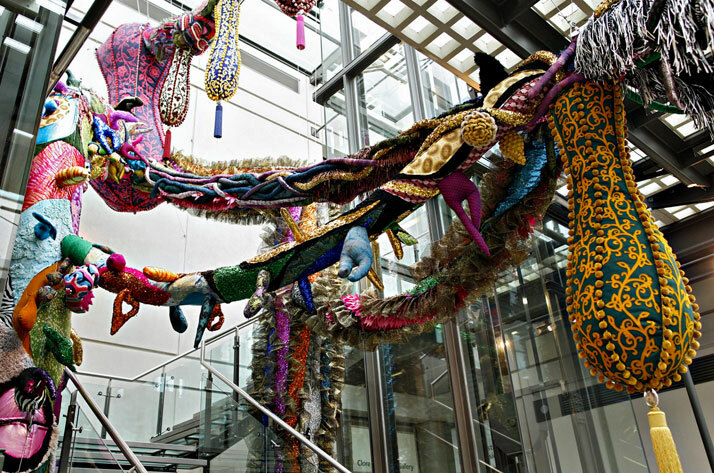 Joana Vasconcelos, Maria Pia, 2013. Rafael Bordalo Pinheiro faience painted with ceramic glaze, Azores crocheted lace. 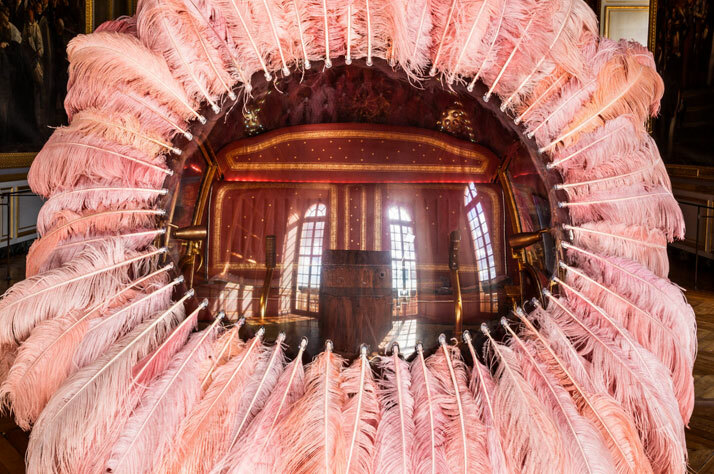 2013 Joana Vasconcelos, Palácio Nacional da Ajuda, Lisbon. 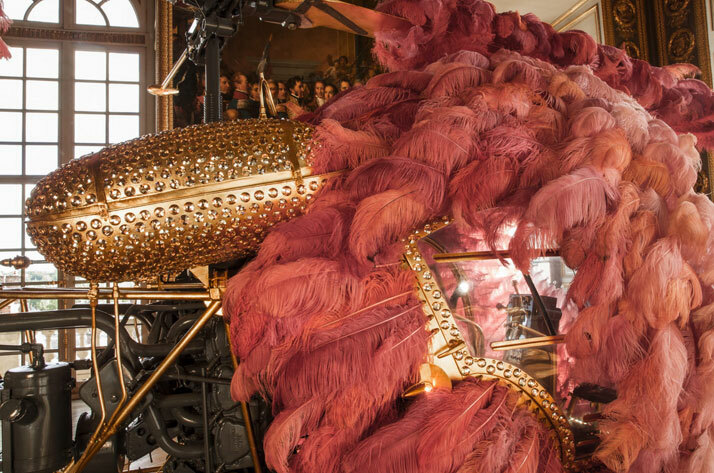 Joana Vasconcelos, Golden Valkyrie, 2012. Handmade woollen crochet, industrial knitted fabric, fabrics, ornaments, polyester, steel cables. 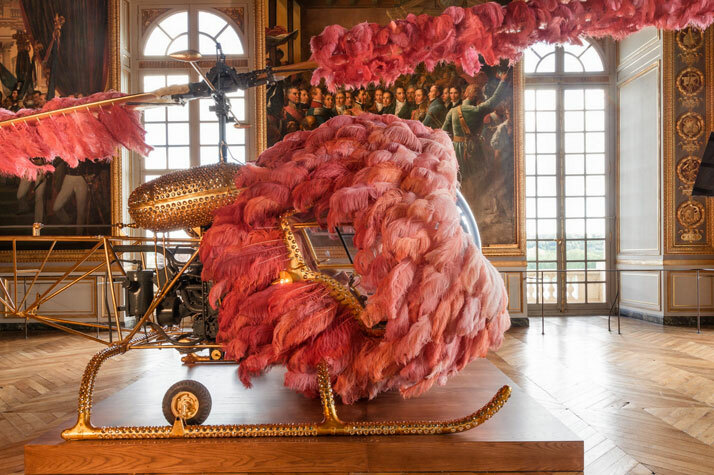 2012 Joana Vasconcelos Versailles, Château de Versailles, Versailles.